Successfully Added 7 Inch Headrest DVD Player with Emulator + FM Transmitter (Pair) to your Shopping Cart. This 7 inch widescreen headrest DVD player is the best way to quickly and easily turn your car into a complete entertainment center. These headrest DVD players feature a built-in region free DVD player that can be used independently of one another or display the same movie using a single DVD disc. They are constructed from high quality faux leather and have a zipper on the side so you can hide them when not in use. This is the perfect way to prevent theft as well as keep them protected from damage. 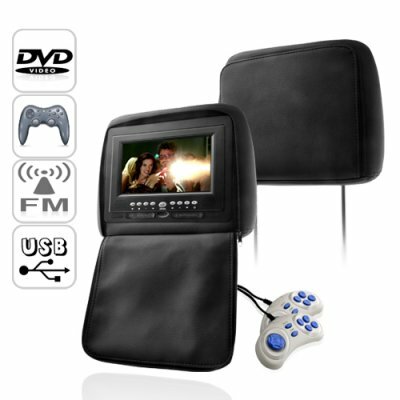 These DVD headrest monitors also come with a built in video game player! That’s right, you can play all of your favorite old school NES and SNES games directly on this device such as: Contra, Super Mario Brothers 1/2/3, Donkey Kong, 1943, Castlevania and much more. There is even support for multiplayer so up to 4 people can play during those long road trips or rush hour traffic. With these headrest monitors you can also use the built in A/V inputs to connect any audio or video source with a RCA (Yellow/White/Red) connection. Common uses include; gaming systems, digital TV receivers, digital camcorders and more. There is even a USB connection and SD card slot so you can play all of your favorite MP3, MP4, Divx or AVI files without having to carry the actual DVD or CD disc. And to make sure you don’t distract the driver there’s also a 3.5mm headphone jack for connecting to your favorite headphones and a IR transmitter if you have wireless headphones. These headrest monitors attach quickly and easily and are perfect for watching your favorite DVDs with since they use a high quality native 16:9 widescreen display. Transform your boring ride into an enjoyable entertainment center for your friends, family and guests, and purchase these DVD headrests today. And don’t forget, they also come with our full 12 month warranty and are in stock now and ready to ship. While easy to install, some people may not feel comfortable connecting these headrest DVD players by themselves. In which case we recommend hiring a professional to install them. The installation should be quick and easy. How can I play the audio using my car’s stereo system? There is two ways. The first is to connect the white and red RCA cables to your cars stereo system. The second is to broadcast the audio wirelessly using the built-in FM transmitter.